We're learning more about the Canon EOS 7D every day, including this hands-on report with a pre-production model by Luminous Landscape. Camera characteristics that folks agree upon include its rugged build, solid feel, 19-point cross sensor autofocus system, 8 fps shooting speed, 24 fps HD video capture, 100 percent viewfinder, and a built-in wireless flash transmitter. All great stuff and wildly tempting for the travel photographer. 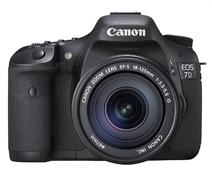 What we're still waiting for is a definitive ruling on the 7D's image quality. Michael Reichmann wasn't comfortable giving us a ruling in his Luminous Landscape article because he was working with a pre-production model. And more broadly speaking, we just don't have enough data from production models. So we'll just have to wait and see. B&H, Amazon, and Adorama are all accepting orders, but as far as I know, no one is shipping units yet in the US. But as photographers start posting their opinions in real world use, I'll certainly keep you posted here.